Weave and wigs can work great as protective styles. They allow you to leave your hair natural and enjoy the convenience of straight hair. No shrinkage to contend with, less detangling, protection from the weather and versatility. However, for some women it may be time to let their natural hair out, to shine in all its glory. Here are some benefits to doing this. Hopefully this will encourage you to take the next step and come away from being reliant on weaves and wigs. So what are the benefits of ditching the weave and letting your hair out more often? As with most things practice makes perfect. The more you leave your hair out the more practice you get at managing it. You will learn the best techniques for maintaining it on a daily basis. This includes forming a hair regimen that suits your routine and lifestyle. You will also have the opportunity to eliminate products and techniques that do not work well on your hair. If your hair is packed away under the weave or wig cap every month, you many only see it once in a while. Some people only take their hair out of the weave to wash it, then they reinstall it all over again. If you wear your hair out regularly you will become familiar with it and learn the best techniques managing it. Detangling my hair this week made me realize it was definitely time for a protein treatment. Because I am familiar with my hair I noticed there was more shedding than usual. I was able to rectify this straightaway because I had access to my hair. When your hair is weaved you don’t have immediate access to it. If there is a problem you will not know until you take the weave out. By this time more damage may have occurred that could have been avoided. When your hair is out you can assess it regularly and decide what action to take, such as: a trim, a wash, a treatment or a moisturizing boost. Many of us know that we should moisturize our real hair regularly when it is in a weave. How many of us actually do this though? I certainly didn’t. It seemed too complicated at the time and out sight out of mind. I spent more time grooming the weave because it was the weave that was visible to everyone. I would take the time to style it with curling tongs or a flat‐iron, moisturize it and blend it with my real hair so it would look its best. I would usually forget about my real hair underneath. If your hair is out more often you will know immediately when it becomes dry and be in a better position to moisturize it. You are also more likely to moisturize it on a regular basis and prevent it from drying out in the first place. When it is hidden away under the weave, it’s easy to forget about it. If you are concerned about the reaction friends, family and work colleagues will have to your natural hair remember that the sooner they see it the sooner they will get used to it. If people see you with your hair out all the time it really doesn’t become that much of a big deal after some time. They also get to see how beautiful it is natural. You may have to deal with comments and questions, some may be negative but you will be better equipped to deal with them after some time. Some people may not admit that they feel more comfortable with you when you wear your weave. The sooner they realize that you are not going to hide your hair away for their benefit the better. There is also that dreaded feeling you get when you have to take your weave out and don’t have an appointment to get it reinstalled straightaway. You kind of feel naked or may not be sure how to style your natural hair in between weaves. Some of us dread bumping into people that are used to seeing us with our weaves. If you wear your hair out you will no longer have to deal with the dreaded ‘in between weaves’ feeling. What you see is what you get with natural hair. Styling your natural hair will become second nature to you. It’s like learning to play the guitar. If you never take it out of the case how will you ever learn to play it? Your natural hair is like a blank canvas, there are endless styling tutorials on YouTube and you may also surprise yourself by inventing some styles and techniques of your own. Weaves and wigs are great protective styles but there are numerous protective styles you can try with your own hair that are elegant and appropriate for all occasions. These include two strand twists, buns, roll tuck and pins, French braids and various updos. Check out CharyJay’s and Fusion of Cultures’ YouTube channels. They are protective style queens. If their styles seem too complicated, you can adapt them to suit you personally. These tutorials should provide you with inspiration; you don’t have to follow them exactly. Remember natural hair is very versatile so there is no reason to get bored or run out of styling options. Check out the series: The Versatility of Natural Hair. 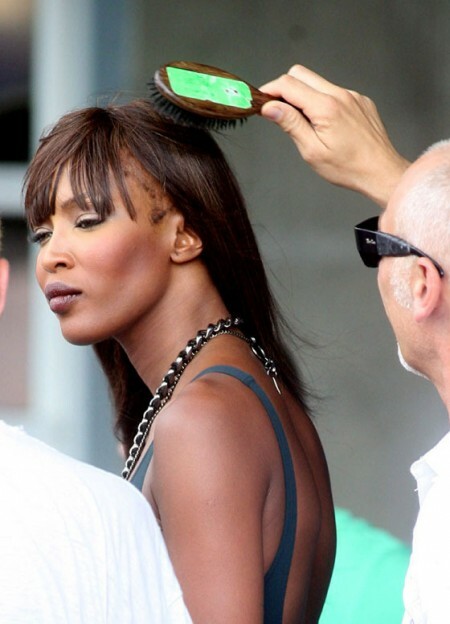 Many of us gasped in shock when we saw the first photos of Naomi Campbell’s receding hairline. 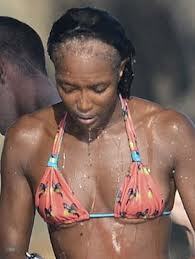 The damage to her hairline was believed to have been caused by years of wearing weaves or hair extensions. In an industry that promotes a certain standard of beauty you can imagine the pressure she was under as a black model to look a certain way. Over the years more photos of her have come out highlighting the same problem that only appears to be getting worse. It is as if the fake hair on her head is taken care of more than her real hair underneath. Traction alopecia can occur if your hairline is constantly put under pressure through sewing, braiding, glues and tight comb attachments. The problems associated with weaves are unlikely to affect women who simply use them once in a while for diversity. They are going to have more of an impact on those women who rely on weaves for everyday use. Another negative aspect is that sometimes weaves look awkward, we have come a long way in ‘weave technology’ but it still isn’t perfect. Sometimes you see people’s tracts showing, your hair doesn’t blend well, or you have hair that sheds like crazy. I don’t consider any of this easier than having my natural hair out. You will also save a lot of money. We seem to be the only race that wears hair texture that doesn’t match our natural hair. Some of us don’t even wear weaves that match our natural afro texture when it is straightened (Yaki). The silky textures seemed to be preferred. I’m glad to see more black owned companies introducing afro‐textured weaves that compliment our natural hair. The more you learn about managing your natural hair the more it will thrive. Most of us had to deal with negative comments from family members when we first went natural. However, the more time that passes the fewer and far between these comments become and we even start hearing more compliments from the same people. Carefully managing your natural hair will result in growth, better styling techniques and overall healthy hair. Like wine, natural hair only gets better with time. Don’t hide away behind fake hair, week in, week out. This is choosing second best to the beautiful hair on your head already. Do you prefer weaves to wearing your hair out? Share your thoughts below. Irene is the creator of NaturalFantastic.com. A UK girl of Nigerian descent, she is now living in Australia. She created NaturalFantastic.com to encourage other women to embrace their natural hair and to share some advice on going natural, and staying natural. No, never wore a weave. I’ve heard some that wear them say that their scalps itch alot due to the cornrowing to hold it up so I knew that wasn’t for me. Hmmm Idk. I wear wigs to protect my hair during the winter. I apply castor oil to my braids and scalp everyday and do the baggy method every other day. Also i takeout my braids on the second week and wash, oil rinse, condition, detangle,deep condition, apply leave in and seal oh and also was my braids in between. My hair has been growing and breakage is minimal or none.. But that’s just me..
I’ve vowed to never wear a weave. Although I’m only 16, i speaks as if not sure. I only would consider getting them on special occasions such as graduation, by the ill be 2 years post relaxer, currently transitioning, and that’s even far fetched. I’ve heard they help your hair grow but then if you don’t take care of it, there’s this. This is horrible, this girl was veing foolish for leaving in her weave that long. yea maybe not represent but embrace.…I too don’t feel its necessarily about ethnicity, but really black people can’t seperate their hair experience from their ethnicity, so I decided to include it. I kind of wonder sometimes. Why bother with medium or long hair (relaxed or not) at all if your going to be under a wig or weave all the time anyway? I think I just prefer being able to change my hair style on my time, but then again, sometimes I just get lazy. None of this I’ll just let it be for 2 weeks. Tangle‐city! You got downvoted, but I know your comment was tongue‐in‐cheek, and I giggled a bit…because there are certainly folks who abuse weaves/wigs like that. I’ve been natural since 2010. I’ve rocked a baldie, a wig, grew out a medium afro, and have worn weaves. Is it that serious to say, “Don’t wear a weave because XYZ?” I like and accept how I look in every situation. I liked the learning curve of caring for my hair WITH a weave. I liked giving my hair a break from styling while wearing a weave. Maybe lots of chicks wearing weaves are in my boat. *shrug* Maybe it’s just not that serious to me. And follow curlskinksfashion instagram for all the fun!!! #8 It caused extreme breakage for naturalista Jenell Stewart and she had to “big” chop again and start over after years of being natural! This article made valid points.. the hair that grows from your scalp is the most important rather it be relaxed, natural, or whatever. I am natural and I’m not opposed to wearing weave. Everyone has an opinion but the only one that should matter is your own. Self image is everything! I don’t get the weaves or the wigs. I cannot understand why so many women are hiding their hair. What is wrong with your own crowning glory????? Have we assimilated so much that we are ashamed of the hair on our heads? What is up???? But why is it wrong to wear weave to protect your hair? Not speaking for all weave wearers, but not everyone who wears weaves or wigs hate the natural state of their hair, it is no different than wearing braids as a protective style. It can also be a way of switching up your style. You can put heat on weave, dye it, what have you and your hair is safe from all of that underneath. LOL come on don’t act as if you have not worn a fake hair on you’re head before. I’mma do what I want to do. Wow, you women who thumbed down Mika’s comment are sick in the head. The truth hurts. Women who wear weaves are SICK IN THE HEAD. Get professional help instead of taking your issues out on your hair! Wow someone thumbs me downed. Sometimes I laugh at how pathetic some people can be. Black women wear weaves more than all the other races combined. Nothing would change my mind that women who wear weaves suffer from serious self‐esteem issues no matter how much denial they are in, even if they like their own hair. I COULD, and WOULD never; I love my own appearance and hair to much to degrade my self to wearing a weave. Open your eyes! I think you should stop acting like a fascist. You are being extremely intolerant of others and their choices. However, It’s your opinion and you are entitled to it but please don’t present your opinion as fact. So not true, Mika! Please check you facts and realize who started this trend before you post. Are you a troll? But I guess because a few white women and white celebrities wear hair weaves it saves the black women from criticism! Whatever. You people are as Nuts as your weaves. Stay deluded if it helps you sleep at night! I could continue to go back and forth, but it’s easy for people to comment on what they don’t know. So more power to you for maintaining your natural hair. I completely agree! 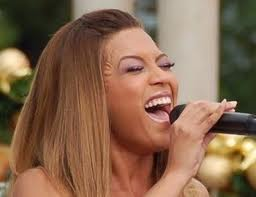 I can do all the legnth retaining methods suggested and nothing allows my hair to grow better than some weave! I can clip my ends, DC, Alternative Poo methods, still breakage. I “protect” it and let it breath 2–4 weeks every 2 months. That’s not true.. it all depends on how well you take care of your hair. I’ve been wearing weaves for like.. 10 years now? My hair has only gotten longer lol. Check my latest video on youtube btw.. I did a review on the BEST weave I’ve ever tried. Seriously, I’m not going back to the regular silky weave! Doing too much of anything CAN’T be good. It depends on how well YOU take care of your hair weave or not. I’m just so scared to wear my real hair out. I feel as if I’m being judged . How do I get over this anxiety ?